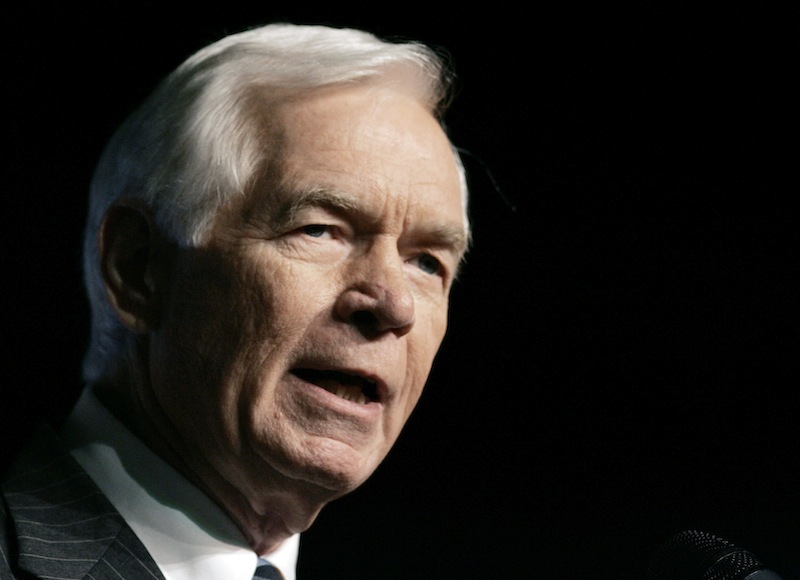 Is Mississippi Sen. Thad Cochran A Grandee Or A Scalawag? According to the quote from William Faulkner often used to describe his native state of Mississippi: “The past is never dead. It’s not even past.” That’s still true today, and you can hear distinct echoes of old times not forgotten in the current red-hot Republican U.S. Senate primary between six-term incumbent Thad Cochran and right-wing challenger Chris McDaniel. To put it most simply, the primary is “about” which of two contrasting Deep South traditions Cochran rightly belongs: the Senate Grandee, who uses his seniority to bring home the bacon and protect his poor but proud state’s interests in Washington, or the Scalawag, the traitor who has gone “native” in Washington and now betrays his people on behalf of alien powers and values. The Grandee tradition runs very deep in Mississippi, as is best reflected in the astonishing fact that just five men have represented the state in the U.S. Senate since 1947. Indeed, the particular seat Cochran occupies has had just one other senator (James Eastland) since 1943. This exceptionally long tenure used to be taken for granted in nearly all Deep South states — particularly before African-American voters and meaningful general elections complicated the picture — where a young candidate for a rare vacant Senate seat would often boast of the ability to pile up mountains of seniority to protect traditions and secure dollars against the presumably hostile rabble of Yankees on the Potomac. In that tradition, Cochran entered the Senate at the age of 41 after a 6-year apprenticeship in the House, and began his climb up the slippery pole of seniority. He has chaired both the Agriculture and Appropriations Committee, and is currently the ranking Republican on the former and the number two member of his party on the latter. In keeping with Mississippi tradition, he has protected the crop programs that benefit many large landowners, and has dutifully secured earmarks and other domestic and military largesse from appropriations bills, without which this very poor state would be immeasurably poorer. These habits have, of course, made him less of a conservative firebrand than might otherwise be the case, though on hot-button issues he is quite reliable (he’s been, for example, endorsed for re-election by the National Right-to-Life Committee, which has given his voting record a 100 percent rating the last five years). But with the radicalization of the conservative movement and the Republican Party that has intensified during the Obama presidency, the perceived value of Cochran’s Grandee position has steadily declined, and he’s in real danger of being seen as that most hated figure, a Scalawag. The Scalawag slur goes back to Reconstruction, to describe white natives who cooperated with ex-slaves and Yankee Carpetbaggers in trying to protect the rights of African-Americans under sporadic federal military protection. It was revived during the Civil Rights era to describe traitorous white southerners who supported “the second Reconstruction” of desegregation and (again) African-American voting rights. While use of the term has died out, its spirit lives on in attacks on politicians like Cochran who have “lost touch with Mississippi values” (a term used constantly in anti-Cochran literature from the McDaniel campaign and outside groups backing the challenger). The Old South subtext of these attacks is strengthened by McDaniel’s own loose association with neo-Confederate groups in Mississippi. But the most visceral effort to accuse the incumbent of abandonment of his state’s conservative traditions has been the now-famous incident on Easter Sunday when a “constitutional conservative” blogger took pictures of Cochran’s long-afflicted wife in a nursing facility, and was subsequently arrested for “exploitation of a vulnerable adult” after a post (quickly taken down, reportedly at the request of McDaniel’s campaign) appeared with the images linked to claims Cochran had abandoned his wife for the high life of Washington. Three other men with ties to the McDaniel campaign and/or tea party groups were subsequently arrested for criminal conspiracy in the case. Whether or not McDaniel had any role in this, his campaign has clearly been sending out a lot of opposition research in the last couple weeks trying to portray Cochran as someone who doesn’t really live in Mississippi any more and might be carrying on a relationship with a longtime member of his staff. No evidence at all has surfaced for the latter charge. But it was clearly the subtext of this story that appeared earlier this month at Breitbart.com. So, as near as I can figure it, the effort to photograph or video Mrs. Cochran was part of building or putting an exclamation point after this narrative about Cochran, which very much was coming out of the McDaniel campaign. And that’s of an out of touch Senator who’s not only abandoned his home state but more cuttingly abandoned his wife. What kind of politician would do this sort of thing? A Scalawag, of course, whose genteel Grandee habits had given way to something sinister and most definitely non-Mississippian. It’s hard to tell how the primary will turn out. The most recent public poll, commissioned by Citizens United, which is backing McDaniel, showed the challenger ahead 43-39 — but that was before the incident involving Rose Cochran broke into the news. Voter reaction to that incident could go in different directions. Will Mississippi Republican primary voters view Cochran as a genteel Grandee whose ailing wife is being exploited by low-road fanatics? Or will they, like the perpetrators of the stunt hope they will, see Rose Cochran as a metaphor for the spurned magnolia of Mississippi conservatism that her Scalawag husband has abandoned for the bright lights and liberal media approbation of a godless Washington? We’ll find out next week.